RED vinyl with a sugar scratch-n-sniff cover, limited 500 hand-numbered copies. Info: Described by Sweden's national tabloid Expressen as "a perfect union of Front 242 and the B-52's," electronic punk group Cat Rapes Dog is back with their first album since 1999. 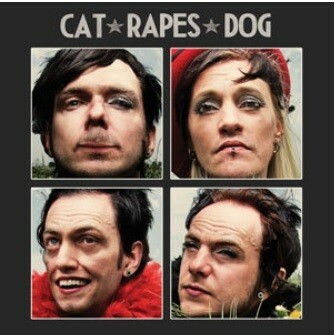 The new album, dubbed Life Was Sweet, is the seventh Cat Rapes Dog studio release and first on label Artoffact. The band gets right to the point and stays true to their punk rock roots, rarely pausing and skipping all filler. The album clocks in at a "fits on vinyl" 35 minutes, but in this short space Cat Rapes Dog will tell you to go out and vote, give you a lesson in religion, and baffle you with a sense of humour all their own. Manic electronic synth lines meet over-the-top male and female vocals on nine tracks of pure DIY weird. Customer evaluation for "Cat Rapes Dog - Life Was Sweet LP (Lim500)"